The animated film "Lady and the Tramp" helped make the Cocker Spaniel famous. After all, what mortal could resist the charming image of Lady (the Cocker Spaniel) dining on spaghetti with plucky Tramp? Still, this endearing breed relied on more than its celebrity status to become one of the United States most popular companions. Known for her lengthy ears, expressive face and beautiful coat, the Cocker Spaniel is a small sweetheart that originated in Spain and was bred as a hunter. This breed was mentioned as far back as the 14th century and was imported to America about the time the Mayflower landed. By 1921, the Cocker Spaniel had an honored place at many a hearth -- the same year it took home Westminster Kennel Club's Best in Show for the first time. 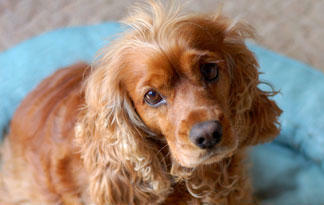 Today, the Cocker Spaniel remains a favorite friend of active families. Thinking of adopting one? Here are five things you should know first.